As we move toward fall, we take this time to once again thank Creative Pinellas for picking us and our "Art Around the World" inclusive summer camp as one of its "Rapid Returns" grant recipients. The funds provided helped offset some of the costs of paying quality, professional instructors who worked daily with 44 kids ages 6-12 of varying abilities. They learned about the art and culture of of France, Vietnam, Nigeria and El Salvador. Each week culminated in a Friday afternoon reception where campers showed 88 guests throughout the summer their work, introduced them to their instructors and the new friends they made and just enjoyed fellowship celebrating art making. Creative Clay was fortunate to receive grants and donations from other organizations in addition to Creative Pinellas, which helped to provide 58 scholarships to cover the $150 weekly tuition. All of the camp surveys completed by parents/guardians rated the camp 5/5, giving their approval and satisfaction with the program. Creative Clay's goal is to continue to provide "Art Around the World" for local kids to have a safe place for art-making, learning, friend making and cultural exchange, as well as understanding of varying abilities between individuals. Enjoy these photos from the last week of camp, which highlights France and shows instructor interaction, a camper fluent in French trying his hand at teach, the amazing art created and the camaraderie among campers who began as strangers, but left as friends. Our "Art Around the World" summer camp for 6-12-year-olds finished its final week last week by focusing on the art, culture and traditions of the country of Nigeria. Campers enjoyed learning about this African country, and made new friends along the way, too. They were delighted on the last day of camp, when they got to be the teacher (and hosts) during the end-of-week reception when they showed their friends and family all of the art they created. One of the pieces they created from that week of camp is already on display at the St. Petersburg Museum of History, which is a bonus and source of pride for these campers. Creative Clay is greatly appreciative to all of its sponsors, including Creative Pinellas, who helped fund the camp through its generous Rapid Returns grant, and the St. Petersburg Museum of History, who proudly dedicated valuable gallery space to showcase these young artists' work. Visit our web site at www.creativeclay.org to learn more about our summer camp, how you can become involved as a volunteer or sponsor (or both!) and about our generous camp sponsors. One of the unique aspects of our "Art Around the World" inclusive summer camp for kids ages 6-12 is that each Friday culminates in an end-of-week celebration in the form of a friends and family reception at our camp site, Brick Street Creative in the Warehouse Arts District of St. Petersburg. This is the day when campers welcome their loved ones and come together to show off all of the projects they've created throughout the week. Last week, campers learned about the art and culture of Vietnam. The low teacher:camper ratio invites collaboration, fosters friendships among campers and allows campers to receive individualized attention and instruction. Valuable volunteers also provide a positive impact by helping, guiding and assisting. These photos tell the story of the "heart" of our camp, an experience that's inclusive because it provides a chance for typically developing children to interact, create and work with kids who have a disability. This is truly making the arts accessible to all! It's hard to believe that week four of our "Art Around the World" inclusive summer camp for kids 6-12 is in the books. Last week, campers learned about the art of El Salvador. Led by Gordon Bonnett and his assistant Michelle Graves, campers learned about the country's culture, traditions and art. They created beautiful pieces of work that are now on display at the St. Petersburg Museum of History and also enjoyed the camaraderie that comes with sharing new experiences with new friends. Children attending our "Art Around the World" summer camp this week are learning all about the art and culture of Nigeria. Nigeria has an artistic tradition that dates back thousands of years. While much of the country's early art had a religious or spiritual significance, many of the traditional arts and crafts evolved over time to include practical and decorative items. Many of the local arts and crafts are regional, but most large markets in the major cities sell items from all over the country. Nigerian artists through the years have created masks, pottery and textiles, in addition to jewelry and other items. Parents will delight in hearing what their children might teach them about this country, its people and its art. The photos above depict some of this week's campers creating art, but also show camaraderie and budding friendships that also happen as part of a valuable summer camp experience. We are grateful to our sponsors, including Creative Pinellas, who help make this camp possible. Their dedication to the arts helps US make the arts accessible to all! Each summer, the success of our "Art Around the World" summer camp is directly attributed to the dedication of our volunteers. Led by instructor Gordon Bonnett, our volunteers, assist, engage and enhance as they work with students ages 6 to 12. We can't thank them enough, and we certainly know we couldn't provide such a successful, thriving, stimulating experience without them. Kudos to all of our volunteers! Campers' art exhibited at St. Petersburg Museum of History. One of the wonderful aspects of our inclusive "Art Around the World" summer camp is the opportunity for campers' art to be displayed for one week at the St. Petersburg Museum of History. We are grateful to the museum for their continued support of our camp, and appreciate the fact that they honor and celebrate the youngest artists in our community with an exhibit of their art. 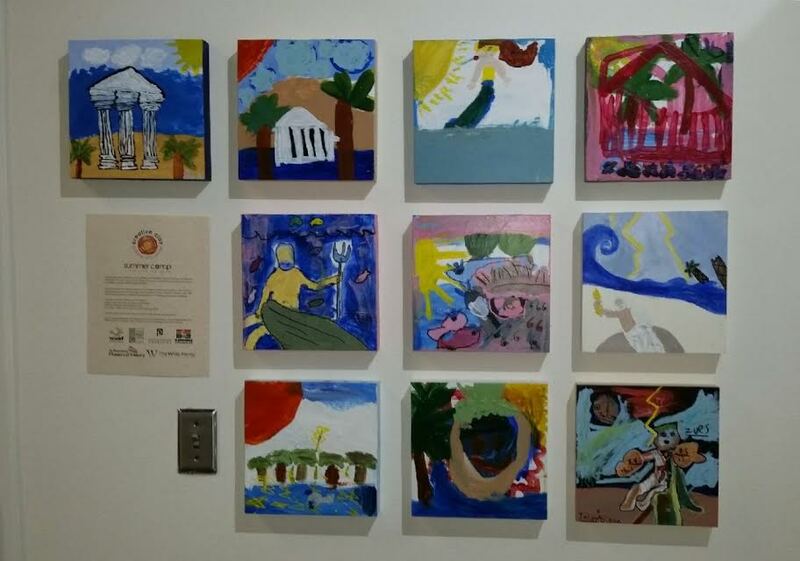 Imagine the pride your child feels when he/she sees their art exhibited beautifully on a wall for all to view, like these pieces from France week at our ‪#‎artaroundtheworld‬ summer camp. Thank you to the museum for your continued support of our camp, and for recognizing that even the littlest hands can create beautiful, significant work. In addition to our campers' art, the museum also houses wonderful permanent exhibits and a new exhibit of photographs of Cuba and Cuban culture. www.spmoh.org. Arthur Campain, from the Bordeaux Region of France, visited campers during the first week of "Art Around the World." He is studying international business and is spending the summer in St. Petersburg and an intern in the EDGE Distrct. First week of our ‪#‎artaroundtheworld‬ Summer Camp is almost in the books. And, what a week it has been. Our sold out camp featured the return of instructor Gordon Bonnet (who is loved by all! ), new volunteers Ms. Megan and Ms. Michelle and a special presentation by Arthur Campain from the Bordeaux region of France. He attends Bordeaux University, studying international business and is a summer intern with the The EDGE District of St. Petersburg. He volunteered earlier this week to teach the students about France. Who better to learn from than a native!